What Happens When You Focus? You know the sensation. Everything seems crystal clear. When something has your full focused attention you see it vividly. Even colors are brighter, and your vision seems to shift into a new realm. The mystery of how focused attention improves the perception of incoming sensory stimulation has long been a question for scientists. In a Northwestern University study, EEG measures of brain activity were used to study how attention alters brain activity. The team of psychologists and neuroscientists used a new strategy for understanding the mechanisms whereby sustained attention and a focused brain makes us process things more effectively, literally making the world come into sharper focus. New scientific research shines a new light on transformative near-death experiences — and proves they dramatically change how a person’s brainwaves operate. Willoughby Britton at the University of Arizona studied the brainwaves of persons who have had a positive, transformative near-death experiences. He found clear evidence their brainwave patterns are different from those who haven’t had a brush with death. It’s interesting to see why some people are transformed and why some people aren’t… and whether studying people with positive near-death experiences can help the people who have negative experiences, Britton said. It’s a profound personality overhaul. Britton found a distinct spike in activity in the left temporal lobe of people with positive near death experiences. The brain’s temporal lobe has often been implicated in reports of feelings of peace and tranquility — and the near-death reports of encountering a bright light, and having increased sensitivity to smells and sounds. The left temporal lobe, the researcher said, is considered the God module, the part of the brain that connects with the transcendent. All of the activity that Britton recorded was from the left half of the brain — not the right half, which is more often associated with visual and spatial creativity. Dr. Bruce Greyson, a psychiatrist at the University of Virginia Health System who also studies people with near-death experiences agrees with Britton, and feels this proves that the mind-brain interaction is much more complex than scientists previously thought. That discrepancy suggests that “our concepts of the role of the brain in mental life, and particularly in what appear to be transformative spiritual experiences, is far too limited,” Greyson said. All those in Britton’s study who came close to dying scored higher on an evaluation of their ability to cope with stressful situations than those who did not have such a near-death experience — regardless of whether their near-death experience had been transformative or not. 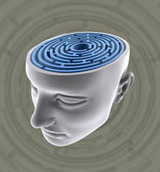 Feel like your brain is a maze lately? Had trouble remembering phone numbers or finding your car keys? Do you have the feeling your memory is slipping? Such little memory problems are often be early warning signs of something that is PROVEN to destroy both long-term and short-term memory – stress. Here’s what you need to know about your memory and stress: Both acute and long-term chronic secretion of stress hormones has a very bad effect on your brain. Many prominent brain researchers have shown that sustained stress damages the hippocampus, the part of your brain that is central to learning and memory. The culprits are the steroid hormones secreted by your adrenal glands during stress — cortisol. During a perceived threat, your adrenal glands immediately release adrenalin. But if the threat is severe or persists after a couple of minutes, the adrenals then also release cortisol. Once in the brain, cortisol remains much longer than adrenalin, where it continues to affect your brain cells. Have you ever forgotten something really important during a stressful situation? Cortisol also interferes with the function of your neurotransmitters — the chemicals brain cells use to communicate with each other. This makes it difficult to think, or to retrieve both short-term and long-term memories. That’s why people get befuddled and confused in a severe crisis. Their mind goes blank because the neural communication lines are down.” They can’t remember where the fire exit is, for example. And this is also why you can’t find your car keys when you are in a hurry, or forget the numbers 911 in an emergency. The stress hormones released then divert glucose, your brain’s primary food, to your major muscles. This is your body’s attempt to get your big muscles ready to either fight or run. The problem is that the amount of glucose – hence energy – that reaches the brain’s hippocampus is then reduced. This creates an energy crisis in your brain’s hippocampus, the place where memories are created. This compromises your brain’s ability to create new memories, and to recall old ones. That may be why some people can’t remember a very traumatic event, and why short-term memory is usually the first casualty of age-related memory loss resulting from a lifetime of stress. Normally, in response to stress, the brain’s hypothalamus secretes a hormone that causes the pituitary gland to secrete another hormone that causes the adrenals to secrete cortisol. When the levels of cortisol rise to a certain level, several areas of the brain (especially the hippocampus) tell the hypothalamus to turn off the cortisol-producing mechanism. This is the proper feedback response. But the hippocampus is easily damaged by the cortisol released by even mild long-term stress. In his book Brain Longevity, Dr. Dharma Singh Khalsa describes how many older people have lost up to 25% of the cells in their hippocampus. So memory-damaging cortisol continues to be secreted. This causes more damage to the hippocampus, and even more cortisol production. Thus a degenerative cascade”starts, and is very difficult to stop. This is why it is so very important to have and use a daily stress reduction regime. Stress is not to be ignored or allowed to just rage on. The damage to your brain can be serious.